Patience is defined as the capacity to accept or tolerate delay, trouble, or suffering without getting angry or upset. My wife can attest that I don’t always posses that distinct quality, but in the month of November my patience increases – at least in the deer woods. Up until November 15, my deer season was going so-so. I had harvested several does with no luck at punching my tag on a Hit List buck. 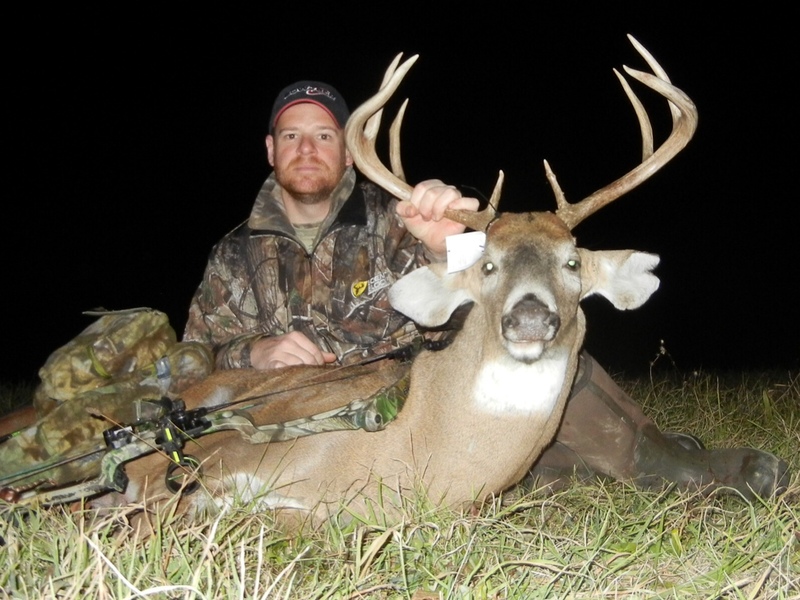 As you read last week here on AHT, my father tagged our number one target deer in on October 31, which was enough for me to call the season a success…even if I had to eat a tag sandwich. I hunted hard through the early part of November, burning over a week’s vacation in an effort to try and seal the deal on a shooter buck. As the days of November ticked by, so did my chances. With the NYS firearms season opening on November 16, I headed in for my final sit of the 2013 archery season on the afternoon of the 15th. I got to my stand early in the afternoon and by 4 p.m. I hadn’t seen a deer. We called my buck ‘No-Tail’ for obvious reasons [see above]. “That’s it,” I thought to myself. And then I heard the distinct sound of a deer walking. I looked down the ridge and to my amazement, a good buck was headed my way. In disbelief, I grabbed my BowTech and prepared for the shot. As the buck walked, I came to full draw. At 18 yards, I stopped the buck with a soft bleat. I centered my pin on his chest and let the arrow fly. It was a center punch. BOOM (fist pump, fist pump)! The buck bounded over to an adjacent knoll and began to go down. As the buck expired I sat down to replay what the heck had just happened. In the final half hour of the season, I had closed the deal. 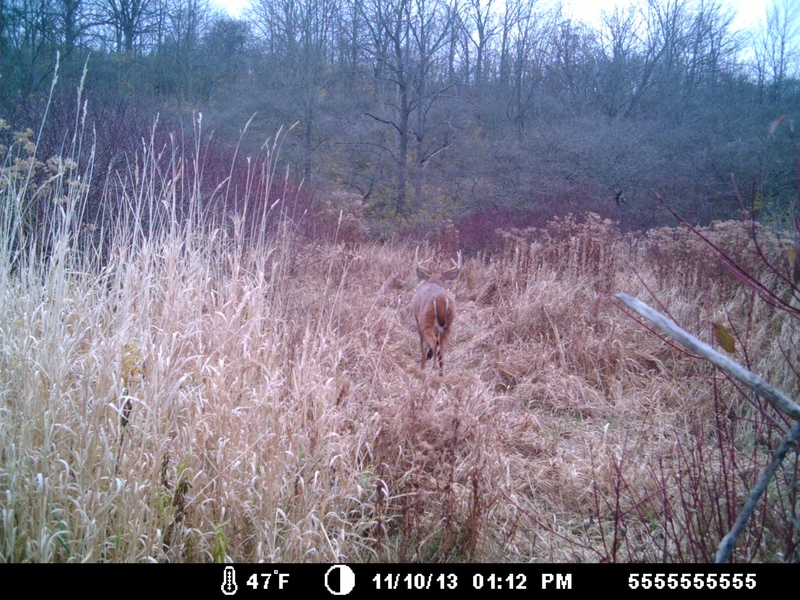 Suddenly all of those hours I put in setting stands, checking cameras, and scouting all seemed worth it. I called my Dad with the good news. 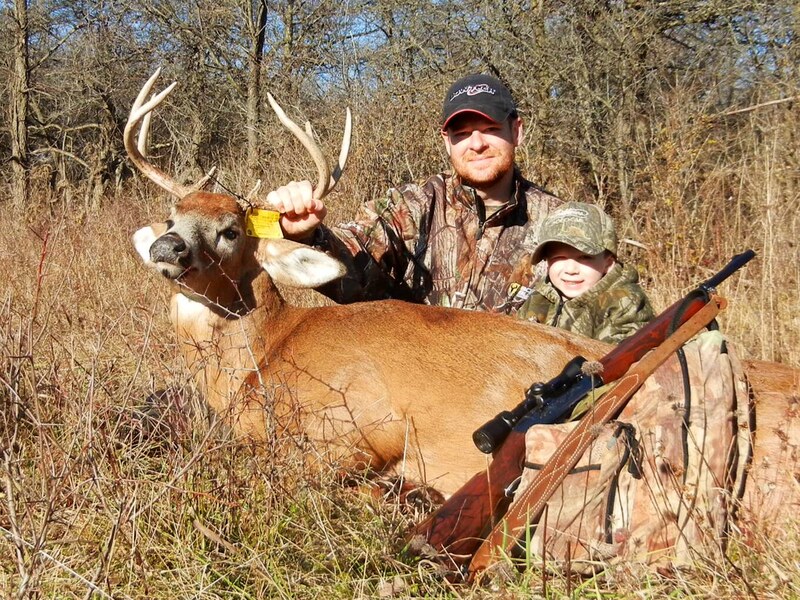 After filling out my tag and collecting my buck, I headed for home to show my Dad and my 6-year-old son. Both were proud. In our celebration and discussion, we’d lost focus of the fact that the next morning was the opening of the firearms season. 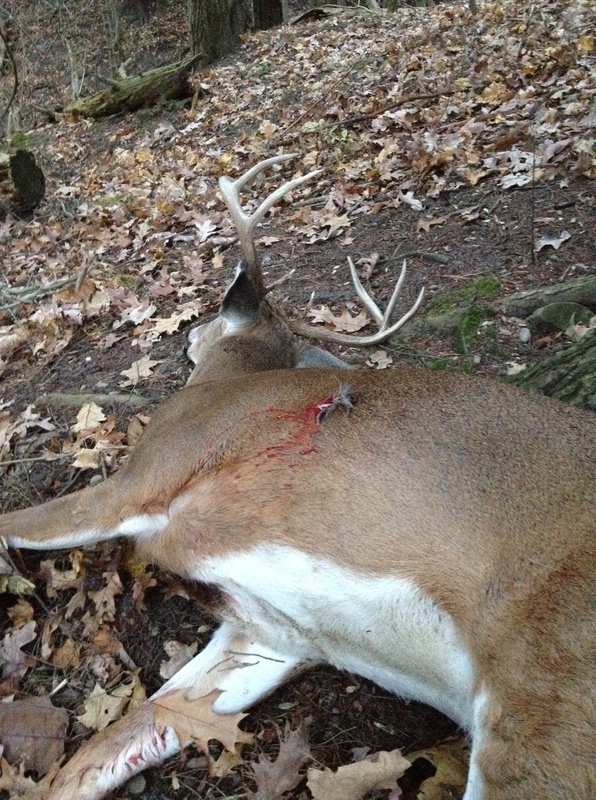 Still on cloud-nine from my archery kill, I racked my brain for ideas on where to go the morning. In a hasty, yet fateful decision, I decided that I’d sit in make-shift ground blind the next morning. There was one buck frequenting this area that I was interested in, but surely I thought he wouldn’t show himself on opening morning. I was wrong. As the sun rose, I was still replaying the happenings of the night before in my head. At around 7:30 I thought I could hear a deer walking in the swale in front of the blind. I came to my feet and couldn’t believe my eyes. There standing 30 yards from me was the exact buck I was after. I grabbed my trusty old Remington 1100 20 ga., centered my crosshairs and fired. Game over. The buck went down immediately. ‘Seriously?’ I said to myself. ‘Seriously!’ I told myself. Unreal. My season had pivoted in a matter of 16 hours. Father & Son bonding moment. After yet another photo session with my son, I sat down with a cup of coffee and began to reflect. Several words came to my mind: Blessed, Fortunate, Family, Persistence, and Patience – The capacity to accept or tolerate delay, trouble, or suffering without getting angry or upset. This year was my 20th consecutive year of hunting the New York State firearms season. 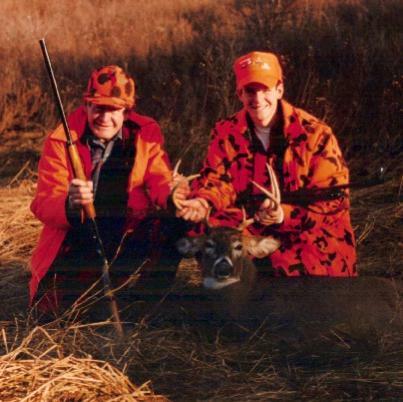 It seems like yesterday I was 16-years-old and hunting with my father and grandfather. Grandpa died in 1998, but I will always cherish the memory of opening day of 1993. 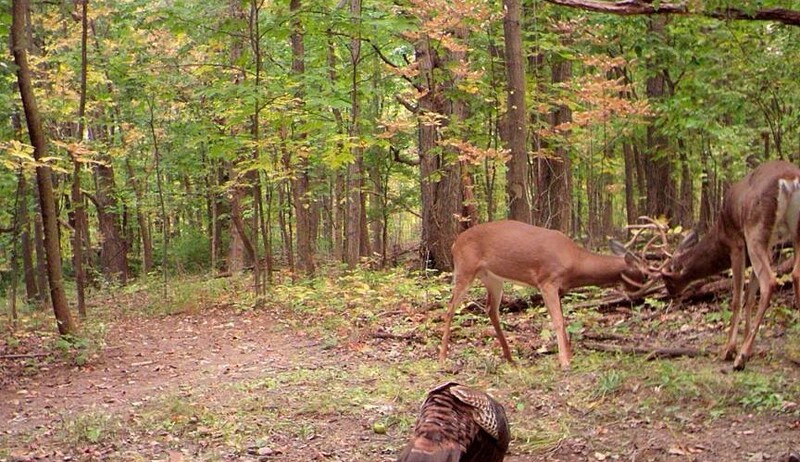 On that morning a fine 8-pointer walked to me and became the first buck I’d ever kill with a gun. Grandpa was there with me that day. I also believe he was there with me this year as I harvested the buck with my gun some 100 yards from where this image was taken 20 years ago to the day. This entry was posted on Wednesday, December 11th, 2013 at 9:12 pm	and posted in Uncategorized. You can follow any responses to this entry through the RSS 2.0 feed. Well written and a nice read, Greg! Congratulations for the persistence, Greg!